Born in Saint-Petersburg in 2001. Anton studies at the Saint-Petersburg High School of Arts (class of an honored artist of Russia Lyudmila Kostromitina). 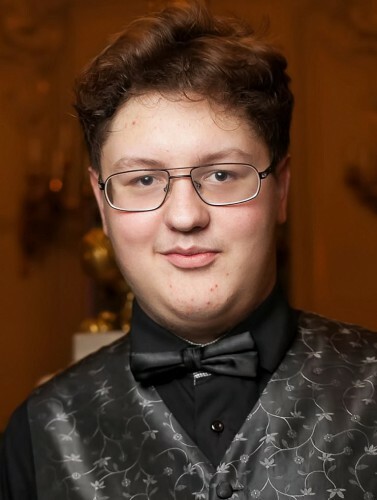 He repeatedly won the St.-Petersburg Open “Miniature in Russian music” competition for young pianists, named after Anton Rubinstein (St.-Petersburg, 2012-2018). He is a prizewinner of the All-Russian “Russia’s young talents” competition (Moscow, 2016, 2017). He was awarded the “Young talents” prize of the Gouvernement of Saint-Petersburg (2013, 2014, 2016, 2017). Anton is a Vladimir Spivakov International Foundation Fellow (2016). He performs in Saint-Peterburg and tours in other Russian and European cities.